Here we are looking at a Linda Manzer cutaway steel string acoustic built during 1980 in Toronto. 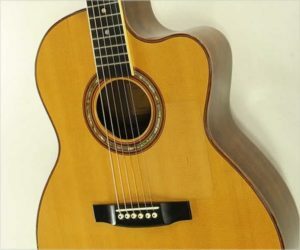 It features a concert body using Sitka Spruce top with Indian Rosewood for the back, sides and headplate, Mahogany for the neck and Ebony for the bridge and bound fingerboard. The nut and saddle are bone. Schaller tuning machines with ebony buttons are installed at the head, and a K&K pickup set has been installed to an endpin jack. This example features Abalone for the rosette and position markers – a mix of dots and a leaflet with stem. The top has a small thin clear plastic tap plate, an excellent idea that protects the top without hiding it. 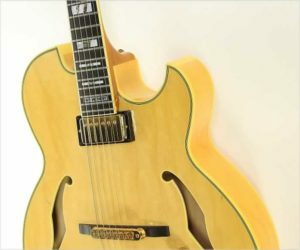 Pat Metheny is one of the great modern jazz guitarists, and the Ibanez PM100 Pat Metheny signature model was part of a line of guitars intended to reflect his style. Built from 1996, the PM100 was discontinued in 2010 though other versions are still built. 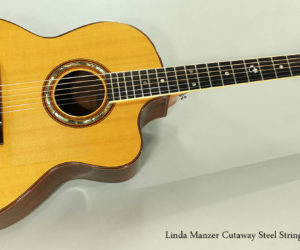 Currently, Pat Metheny mostly plays guitars built by renowned Canadian luthier Linda Manzer. Linda Manzer has been building guitars for over 30 years and like so many top Canadian luthiers, started with Jean Larrivee.